Both chambers of the National Assembly expressed readiness to receive President Muhammadu Buhari at a joint session to present the 2019 budget estimates. In spite of the ongoing industrial action by members of the Parliamentary Staff Association of Nigeria (PASAN), which has paralysed parliamentary activities since Monday, the National Assembly is set for the presentation of the 2019 Appropriation Bill. Buhari, had last week written to the parliament stating his preparedness to lay the budget before a joint session of the National Assembly today. At their separate sitting, yesterday, both chambers of the National Assembly expressed readiness to receive President Muhammadu Buhari at a joint session to present the 2019 budget estimates. President of the Senate, Bukola Saraki, who read a letter from Buhari on the floor of the Senate, seeking an audience to present the budget, revealed that the presentation will hold in the Green Chamber of the House of Representatives. As at press time, it could not be confirmed if the president will be on ground to present the budget. Unlike in the past, there was no accreditation of National Assembly staff and journalists who will provide essential services and coverage of the event. 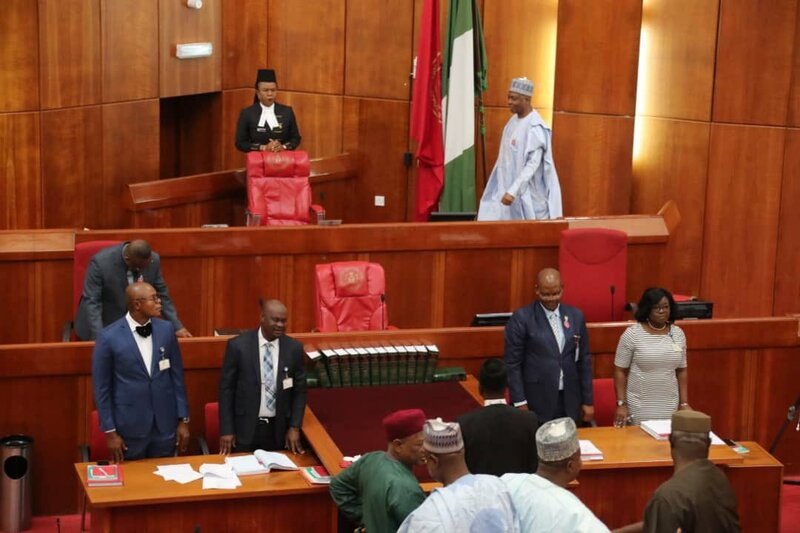 In the meantime, the ongoing industrial action embarked on by members of Parliamentary Staff Association of Nigeria (PASAN) has taken a toll on the Senate. Many lawmakers did not turn up for yesterday’s plenary. When the Senate converged, it could not form the constitutionally required quorum of 37 members. A census showed that less than 20 members attended plenary. Saraki, who presided, did not come into the chamber until 12.10pm while business of the day did not commence until 12.30pm. Only two items on the Order Paper were accommodated before lawmakers ended plenary at about 1.05pm. Similarly, at the House of Representatives, only 40 lawmakers were in attendance at the plenary which started at 12.11 pm with 16 lawmakers, including the Deputy Speaker, Yusuf Lasun, who presided. However, as proceedings progressed, another 24 members joined to bring the tally to 40. The quorum required for the sitting of the 360-member House is 120 lawmakers, which is one-third of the House. Shortly after the opening formalities, the House adopted a motion by the House Leader, Femi Gbajabiamila that President Buhari be allowed access to the legislative chamber today to present the 2019 Appropriation Bill, before the joint session of the National Assembly. Thereafter, Gbajabiamila, raised a Point of Order. Speaking under personal explanation, he said contrary to reports in a section of the media, the leadership of the National Assembly had nothing to do with ongoing strike by workers of the federal legislature. “This House holds some responsibility to explain to the Nigerian public why the House is scanty. Mr Speaker, the members of PASAN are on strike. This strike has nothing to do with the lawmakers. Their strike has nothing to do with the leadership of the National Assembly. It has to do with the National Assembly management. It is important so that the narrative is not distorted. Meanwhile, the Secretary to Government of the Federation (SGF), Boss Mustspha, has said the 2018 budget of the federal legislature has been released. Mustapha who stated this in Abuja, yesterday, while fielding questions from National Assembly correspondent, said he was at the National Assembly to attend a meeting of the House of Representatives caucus of the All Progressives Congress (APC), noted that at least 50 percent of the funds for lawmakers constituency projects have also been released. He said his visit to the National Assembly had nothing to do with the strike embarked upon by PASAN members. However, security personnel, yesterday, prevented striking members of PASAN from accessing the National Assembly complex. The workers are on a four-day warning strike, which began on Monday, to press home their demands for payment of their outstanding salary arrears and better condition of service, among others. A News Agency of Nigeria (NAN) correspondent at the scene reports that the main entrance from the Federal Secretariat was barricaded by the operatives, majority of who were police operatives. National Assembly leadership had on Monday directed the police and the State Security Service (SSS) to ensure adequate security within the vicinity of the National Assembly from Tuesday. Addressing newsmen at the gate, chairman of PASAN, Mr. Musa Muhammad, described the shutdown as unfortunate. He said the action was a demonstration of the insensitivity of authorities to the plight of the workers. “The management of the National Assembly has helped us by barricading the gate, and not allowing the staff to enter. “I think they have shot themselves in the foot. This is to show the world that they are insensitive to the plight of the staff. The staff are law-abiding citizens. “We have never carried out this kind of action before, and to make the whole case worse, you cannot ask your staff to stay outside,” Muhammad said. He denied allegation that the association prevented non-members from entering the complex to carry out their lawful duties. Muhammad also said PASAN was not behind the disruption of electricity and water supply in the complex on Monday. “We never asked anybody not to go and perform their duties. Ours is for own staff. “Yesterday, bankers were allowed in, all other workers who are not our members were allowed in. “Not even the legislators, we have never stopped them from carrying out their legitimate function. “We didn’t instruct anybody to shut down electricity and water supply, and as I speak, we are not sure that was carried out by our members,” he added. PASAN chairman said the strike was not to disrupt the planned presentation of the 2019 Appropriation Bill by President Buhari to the National Assembly today. The leadership of the National Assembly, had on Monday night, directed the Police and the DSS to ensure adequate security within the vicinity of the National Assembly from yesterday to enable members and staff come in and perform their legitimate duties without any hinderance. The meeting was called by the political leadership to listen to the management led by the Clerk to the National Assembly (CNA), Mohammed.